Ok so we know we’re not nexcessari…nessea…..neccesiri…. 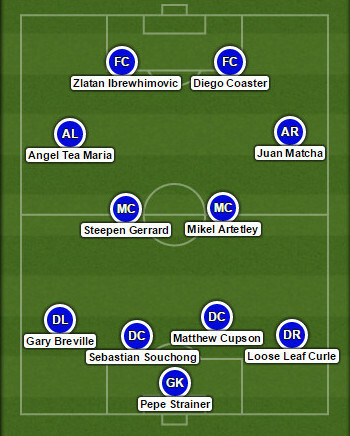 new to the idea of a football eleven based around a particular theme. Radio stations such as talkSPORT and 5 Live do it all the time. Or at least they used to do it. Maybe I’m just getting old? Essentially you get the subject; say ‘Fish’. Then the listeners come up with a footballer, past or present, that fits in with the fish theme. Conor Salmon is too easy. How about Neil ‘Razor’ Haddock? Ok so that’s quite average. Seabasstian Bassong. Better, although we kind of used him for the #teaXI. It got us thinking and it got Nina Baker (another good friend and regular contributor to the #teaclub) thinking too. Then Nick Calvert (personal friend and fan of tea) weighed in with a few. @martandvic also chipped in and didn’t disappoint. It made for a very entertaining hour or so and the creativity was endless. Full credit to these people for joining in. So what did we come up with? Here’s our thirst eleven. Ground: Chaibury. Chairman: Roman Assamovic. Thanks to everyone for their contributions. Special acknowledgement of David Teaman, Michael Earl Grey and Matea Vydra Next time we shall do a #BiscuitXI.